A small magical book, using the familiar nursery rhyme, which fulfills the basic definition of a spell. The last page offers a haiku-like 17 syllable verse on the art of making magic, written by the artist. The old ways are often hidden in children’s fairy tales and rhymes, passed along in the manner of “old wives’ tales.” Many such examples exist: see the books The Tao and Mother Goose by Robert Carter for an interesting examination of this theme, as well as The Uses of Enchantment by Bruno Bettelheim, and much of Joseph Campbell’s writing about mythology. Derived from an original book, now in a private collection. Handmade french-fold accordion book, printed and bound by the artist. Pages digitally printed on both sides of a single half-sheet of Zerkall book paper with archival pigment inks. Background reproduced from a watercolor painting, on which the words STAR SPELL were brush lettered large in resist, and the paper then painted in layers of watercolor to reveal the words in the twilight starry background. Text lettering reproduced from original calligraphy. Flyleaves of sheer Japanese unryu “cloud dragon paper” with silver and gold flecks. Book is sewn into handpainted paper cover which wraps around, the front flap decorated with a star shape in the form of a fire-invoking pentacle, and tucked into the cover. This book structure can be gently unfolded to see the large lettering on the painting in the background, and to find hidden words on the reverse near the binding. The last three images show the book in the beginning stages of unfolding; the next shows the entire flat page as it looks before cutting, folding and sewing, and the last shows the deluxe edition, with star gilded and silver painted white slipcase. Deluxe edition numbered 1 through 13. 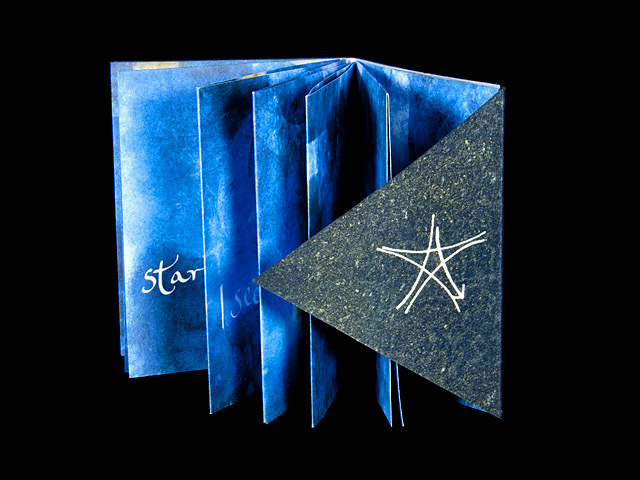 Stars on front cover and title and final pages laid with palladium leaf. Housed in a hand-painted slipcase. Standard edition numbered 14 through 53. Stars hand painted in iridescent ink on front cover and title page and final pages. 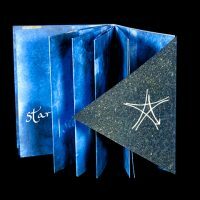 For an in-depth essay entitled “The Making of Star Spell” about the creation of this book, visit the Library here.